The waters surrounding St. Croix are ideal for sport fishing and record size catches are not uncommon...be it Off Shore or Inshore Game Fishing, Shallow Water and Flat Fishing. The weather is perfect year round and you will spend a lot less time getting to the fish than you are accustomed to elsewhere. This is because the waters around St. Croix plummet to over 3000 feet very close to shore! 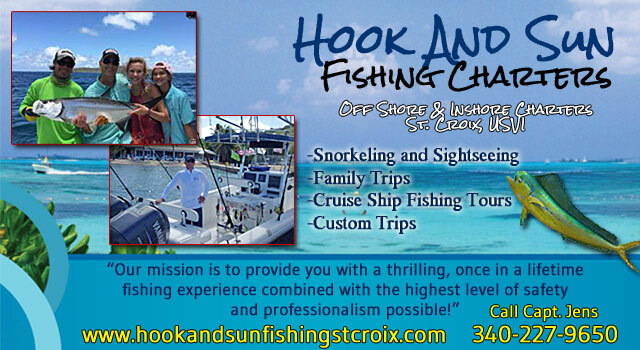 For a half or full day of fabulous St. Croix sport fishing, choose one of the charter companies below. Fishing St. Croix Charters USVI - 340-244-1335 - World records have been set by sport fishermen here in the Caribbean. We catch many migratory fish such as; Mahi, Wahoo, tuna, and marlin while trolling, and swordfish by deep-dropping. . Bottom and near-shore fishing brings us; blue runner, many types of snapper, tarpon and always a few surprises. Whatever you desire, whether it be near-shore or offshore, we do not have to travel far to start fishing. Our team’s goal is to offer you a fun, safe, entertaining fishing experience. We strive to have each guest catch a great fish and experience a trip they will remember “Forever & Always”. Imagine deep water only one mile offshore. We have been operating fishing charters from St. Croix for over 30 years and are known for our outstanding catches of: Dolphin, Tuna, Wahoo and Marlin. We will take you to some of the best off shore fishing grounds in the Caribbean Sea! 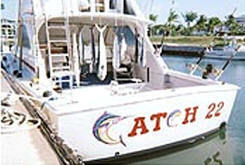 CATCH 22 is a 38' Bertram wide body sport fisherman. (Prices may vary according to fuel surcharges. All trips must be cancelled within 48 hours to receive a refund. If trips are not cancelled within 48 hours the credit card will be charged the full price of the charter.) Maximum Six (6) passengers. Trip includes: bait & tackle. All fish stay with the boat, but Capt. Dave will be happy to provide the angler’s with a portion of the catch for dinner. Hook and Sun Fishing Charters - Call Captain Jens Hookenson at 340-227-9650 - Off Shore & Inshore Charters - Snorkeling and Sightseeing, Family trips, Cruise ship fishing trips, custom trips. Our mission is to provide you with a thrilling, once in a lifetime fishing experience combined with the highest level of safety and professionalism possible! Altona Lagoon and Great Pond, St. Croix. No Commercial fishing. A recreational shrimp fishing permit is required for the harvesting of shrimp. A $10 one-year permit is available at the Division of Environmental Enforcement St. Croix office (contact information on back cover). More information can be found in the U.S. Virgin Islands Commercial & Recreational Fishers' Information Booklet published by DPNR’s Division of Fish and Wildlife and the Division of Environmental Enforcement, dated July 2012. Download DPNR's Booklet (PDF File).